In order to keep your slate floors in excellent condition, they will need to be swept daily. This is especially true in the first few months after your slate floors are installed. This is because of a process that is known as, “spalling.” Spalling is a normal process that happens to slate surfaces where pieces of the material may flake off the surface layer. This will eventually stop on its own, it is just a matter of time, allowing the slate to settle into its new home. Whenever you mop your slate floors you will want to use a gentle cleanser. You will want to use a cleaning product that was designed specifically for natural stone, such as the one we sell for stone flooring and counters. Our solution is non-acidic and does not contain lemon or vinegar. This will help preserve your slate. Once you have cleaned it, you will want to rinse the surface with clean water and use a soft cloth to mop up the remaining moisture. Like most other natural stone materials, slate flooring will need to be sealed in order to protect it against water and prevent staining and scratching. 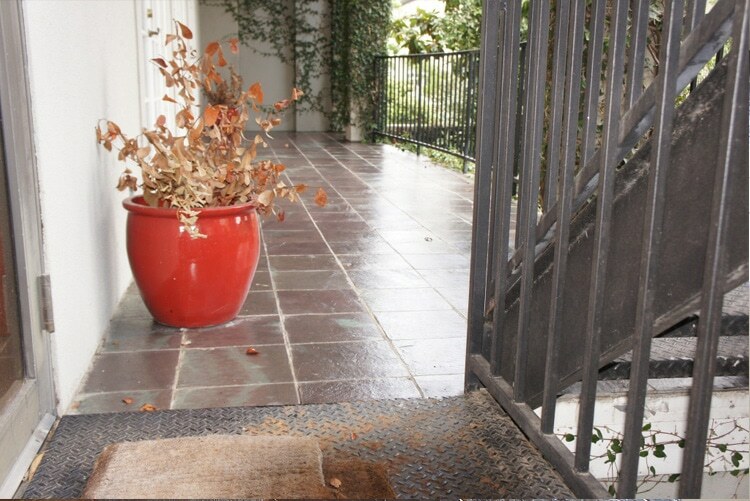 The stone sealer should be applied on a yearly basis because it will wear down. If you have slate flooring in an area with heavy traffic, such as the front room of an office building, you may need to seal your slate floors more often than once a year to protect them. To see if your slate tile needs sealing, pour a bit of water on its surface. If the water leaves a darkened spot for longer than 10 minutes, it needs sealer. Some types of slate may need sealer application more often than others. An unfortunate sensitivity that comes along with slate flooring is that it does scratch more easily than other flooring options. If a scratch does occur, we can inspect your slate and see if it is possible to restore your surface.